Newton Aycliffe logistics firm Stiller Warehousing and Distribution is set to open its doors to potential employees as part of its latest recruitment campaign ahead of another expansion which is close to completion. 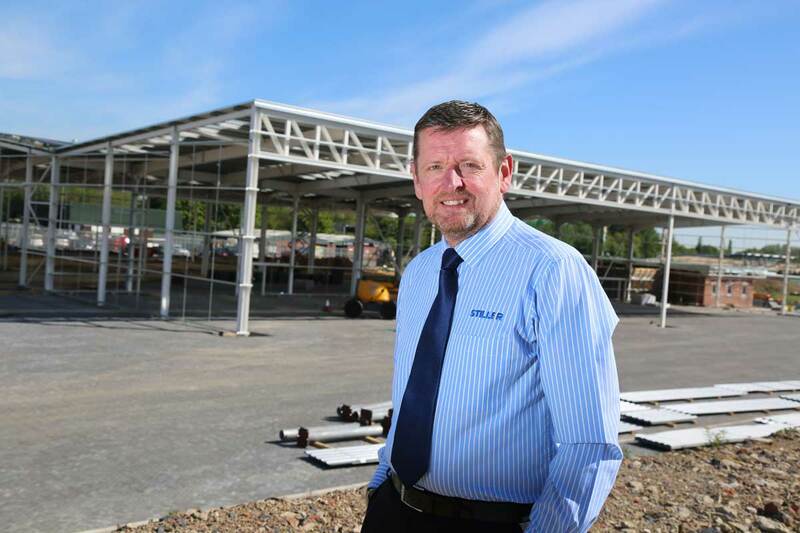 Stiller is creating the new 50,000 sq ft facility at its 22-acre site on Aycliffe Business Park to help the firm cope with sustained growth which has seen annual sales rise by more than 20% to £14.4m. The palletised distribution centre, due to be completed in July, will be the largest of its type in the North East and will allow Stiller to load 30 vehicles at any one time. The scheme, which is being project managed by award-winning Darlington firm Wharton Construction, will also create more than 60 off-street car parking spaces and include a new large open-plan office for over 20 office staff. Bosses at the firm, which has already taken on 26 new employees this year, say the project could create up to 25 new jobs, which would take Stiller’s total head count to 190. Stiller, well-known for using innovative ways to recruit staff, is looking to take on at least eight new LGV drivers as part of its latest growth plans. And the family-run firm is hosting a recruitment open morning at its premises on Aycliffe Business Park on Saturday June 2 (8am-midday). It’s an ideal opportunity for those interested in taking up a driving job, and potential candidates will be able to meet some of the firm’s staff, take a look at some of its equipment and learn about the type of work it does. It’s the company’s latest new way of trying to recruit drivers after previous successful initiatives, including an ‘earn as you learn’ programme which recruited four new staff. Stiller operations director Brian Simpson said: “We’re gearing up for a major recruitment drive this year as our new North East Freight Centre nears completion, and new drivers are a big part of those plans. Stiller successfully launched its own in-house “earn while you learn” training pathway programme in summer 2016, with four people completing it. The firm has also previously ran successful programmes to attract ex-servicemen and overseas employees in a bid to combat a nationwide shortage of drivers. Some of the benefits of working for Stiller Warehousing and Distribution include day shift set-salary positions and working with a modern vehicle fleet. Stiller’s latest investment in equipment, people and facilities – including two new warehouses costing more than £1.8m between them – takes the company’s total spend to almost £9m in the last three years. More than £1.1m was spent on a new state-of-the-art, 40,000 sq ft warehouse in 2015, increasing the company’s warehousing capacity to 200,000 sq ft, and last year it invested another £750,000 in a 40,000 sq ft extension, which was completed earlier this year, while more than £5m has been spent on new vehicles in that time. Stiller provides cost-effective warehousing and distribution services to businesses in the North-East region as well as commercial property lettings and is also a member and major shareholder in Palletline, a national co-operative network of 70 companies. Its 22-acre site in Aycliffe stores goods and parts for well-known national brands as well as local businesses including Gestamp Tallent and 3M. Interested class C and class C+E drivers can turn up on the day, but for more details call 01325 313140 or email john.parker@stiller.co.uk.